I’ve always been a brick-and-mortar shop sort of person, if given the option. This is especially true for me when it comes to shopping for things like yarn and fabric. Out West, I’ve been doing my best to find local crafty shops. Obviously, different stores are different, but I’ve had some successes and difficulties finding places with a similar ‘feel’ and stock as the shops back east. This is, I think, especially true for quilting fabric. There are lots of great options, and the options that do exist are huge, and have a grand selection in terms of sheer quantity of fabric and notions and machines. This is great on a lot of fronts – when I was ready to upgrade my machine, I was able to find the one I wanted in store, and one of the shops near me has an excellent selection of flannel for pyjamas, which is pretty important. But these stores and I, we definitely disagree when it comes to taste in printed quilting cottons. Granted, I was a little spoiled, living so close to amazing shops like Needlework and The Workroom, but the stores out here are just – different. A lot of the fancy ‘modern’ fabric lines and designers I’ve grown fond of just aren’t stocked out here. Which isn’t to say that there aren’t options, by any means. But the prints available tend to run towards a certain aesthetic that’s either quite traditional (lots of floral reproductions and batiks) or quite – novelty-ish. Possibly arranged by theme (Star Wars, boats, cowboys, space). But nothing quite gets me like the food fabric. Oh my god, the food fabric. You’ve seen it – that bolt that’s printed with photorealistic illustrations of potatoes, or beer cans, or halved avocados. There is so much of this, and it’s definitely not my jam. I was lamenting this on Twitter last weekend with Austen, who also had a fairly recent move from the big city to the land of novelty fabric, and she suggested an alternative. Rather than fight the novelty food fabrics, we should embrace them, with a swap. 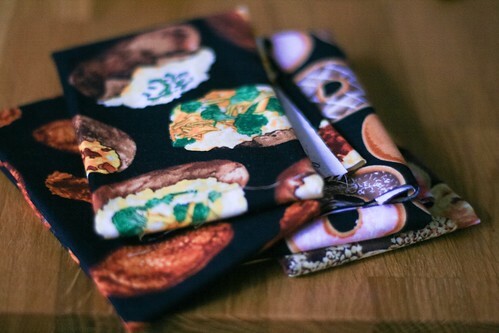 The Horrible Hyperrealistic Food Fabric Stowe Bag Swap. 1) Each swap participant must sew one Stowe bag, in the small size. 2) Each bag needs to use at least two different food fabrics. Artist’s choice as to whether these two fabrics depict foods that are palatable together, either visually or gustatorially. 3) Bags go in the mail by Feb 15th. I’ve already picked out my Foods Of Choice, and I kind of can’t wait to turn them into something ridiculous. Would you like to play, too? Does your local quilt shop also have an Aisle Of Horrible Hyperrealistic Food Fabric? (Or do we perhaps share the same local quilt shop?) We’d love it if you joined us. If you’re planning to swap with people you know and like (? ), feel free to post on social media with the hashtag #HHFFSBS.